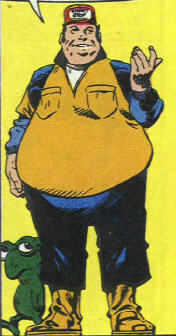 (US One#1 (fb)) - The Short Stop was a truck stop owned by Ed "Poppa Wheelie" Wheeler and his wife, "Wide Load" Annie. It was a favorite amongst many truckers, including the parents of US and Jefferson Hercules Archer. When their parents were killed, the two boys were adopted by Poppa Wheelie and Wide Load Annie. Later, when Jefferson had been apparently killed and US had been injured by an attack from the Highwayman, Poppa and Annie supported US in his plans to design his dream truck, the US1. (US1#1) - Poppa Wheelie was present when US confronted the Highwayman and ran him off the road. (US One#2) - After one of the many trucker's brawls that occurred at the Short Stop, their was a small round of cattiness as Mary McGrill and Taryn O'Connell vied for the affections of US, who left them both behind. (US One#3) - A man--who turned out to be the Highwayman in disguise--gave a dubious account of the legendary origins of the Highwayman. US and Retread went after the man. (US One#4) - Following yet another brawl, Baron von Blimp hovered over the Short Stop and issued a racing challenge to US. The race started from the Short Stop and was presided over by the Chicken Colonel. (US One#6) - Annie and Poppa were unable to make their mortgage payment, due to US's hospital bills, the cost of financing the construction of the US1, and US' lack of taking any hauling jobs due to his pursuit of the Highwayman. Phil LeGreed, one of a trio of realtors seeking to foreclose on the mortgage of the Short Stop and make it their own, threatened Wide Load with his plans after the missed payment. Annie tossed him out through the front window and chased him off. Later, to avoid the heat, she went out on a trucking trip with US. (US One#7) - Annie and US returned to the Short Stop, where Midnight used her hypno-whip to take control of each of the regular cast. The first sign that something was wrong was when LeGreed showed up and tried to have Wide Load arrested for her previous assault. Even when he went so far as to call her a "horrid, unkempt, fat excuse for a woman!" she just looked on blankly and calmly apologized. Midnight and the cast attacked US, who used his remote control device to send the US1 after Midnight and drove her off, after which he used her whip to free everyone from her control. 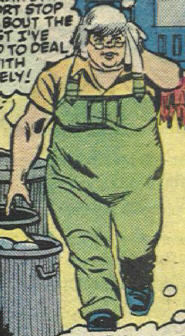 (US One#8) - When Taryn returned, looking rather haggard, Mary accused her of secretly being Midnight and revealed the costume she claimed to have found in her truck. Taryn panicked and took with the whip, but US ran her to the ground, at which point the real Midnight showed up to reclaim her whip. Clutch, Grab, & LeGreed plotted to prevent Annie and Poppa from making their mortgage payments so that they could foreclose on their loan and sell the land to the Bongo Condo Corporation. (US One#9) - Clutch, Grab, & LeGreed joined forces with Baron von Blimp against the Short Stop. Midnight used her whip against the cast/crew, but a brawl erupted, involving the crew, the customers (who were mad from the lack of service), and a bunch of von Blimp's pseudo-neo-Nazis. US broke Midnight's control over the crew and then Taryn attacked her, exposing Midnight as Mary McGrill, who had been controlled by the Highwayman. (US One#11) - While Clutch, Grab, & LeGreed bailed out on von Blimp, the Aliens sent the dumpy dirigible driver and his pseudo-neo-Nazis to downtown Tel Aviv, where they were not met with happy faces. The Aliens revealed the full origins of the Highwayman and their intended plot: Space needs Truckers! The Aliens then set up a final race between US And Jefferson to determine their champion. (US One#12) - The crew helped US supe up the US1 for the race around the world, which he won. Everyone was sad to see US go, but then Al the Alien said, "We could sure use some good home-cooking in space. And judging by the way you helped adapt US' rig to our advanced technology, it won't take long for you to become crack celestial mechanics!" He invited Annie and Poppa to join US in space, and they agreed. Mary and Retread decided to go, too, but Taryn was too frightened by the idea and stayed on Earth. The Aliens lifted the entire Short Stop up into space and brought it with them, and sometime later it had been set up as the Star Stop in a "well-traveled quadrant of the Milky Way." Clutch, Grab, & LeGreed then foreclosed on the loan and brought a Bongo Condo Corporation representative to see the land. However, they found it glowing with radioactivity and refused to buy it. (Sensational She-Hulk#4-7) - Sometime later, Taryn, regretting her decision not to accompany US Archer into space, recruited Razorback to help her hijack the Starblazer space shuttle so she could rejoin him in the Star Stop. They ended inadvertently bringing the She-Hulk with them. Upon arrival, they found Poppa giving directions to Vance Astro and the Guardians of the Galaxy. He was quite glad to see Taryn again, but he and Annie informed her that US and Mary had gotten married and were expecting their first child any day now. And then Xemnu the Titan crashed the US1 (now the Star Rig) into the Star Stop and flattened everyone present with his mental powers. Xemnu revealed his plot to take US and Mary's baby as part of his plot to repopulate his home planet, but the She-Hulk and Razorback destroyed his machine and saved Mary and the unborn child. Xemnu then escaped with the She-Hulk and attempted to transform her into one of his race, to be his mate. However, this plot was foiled by Al and the Aliens, who captured Xemnu, dampened his powers, and placed him in the possession of Big Enilwen. Razorback and Taryn were hired to continue piloting the Starblazer, which he had renamed "Big Pig III," into even deeper regions of unexplored space. (Sensational She-Hulk#45 (fb)) - Taryn and Buford followed a distress signal to the fourth planet in the Dandesh system, where they found Rocket Raccoon battling what appeared to be the Asparagus People (D'Bari). Rocket was turned to stone and Razorback and Taryn were trapped and captured. 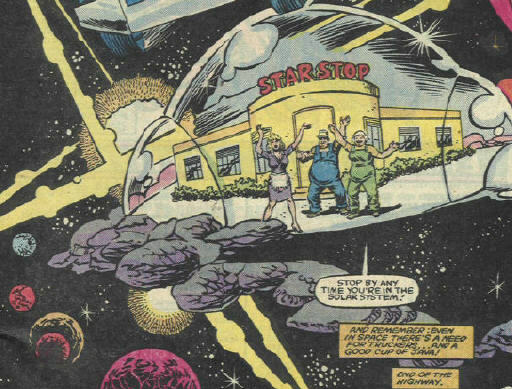 (Sensational She-Hulk#40 (fb)) - The Star Stop was assaulted by wave after wave of meteor showers, which threatened to destroy its protective shield. Annie realized that their was an intelligent force behind the attacks. (Sensational She-Hulk#39) - US and Al tried, to no avail, to stop the meteor showers. Al got the idea of bringing in the She-Hulk for assistance. (Sensational She-Hulk#40-43) - Al reactivated the She-Hulk's cars space travel capabilities and brought her, and her friend Weezi Mason, to the Star Stop's sector. They recognized the attackers forms of Spragg the Living Hill, and She-Hulk agreed to help them. After some struggle, She-Hulk came up with successful idea of snaring Spragg inside of a metal net, nullifying his powers. They gave Spragg to Big Enilwen, who revealed that he had released Xemnu, who promptly appeared and attacked them all anew. Xemnu overpowered the She-Hulk and bragged endlessly about his plans for her until Weezi cold-cocked him from behind with a giant wrench, knocking him out. Retread then revealed a message from Razorback and Taryn, who had been captured by the Asparagus People. (Sensational She-Hulk#44-46 - BTS) - US, Retread, She-Hulk, and Weezi set out to rescue Razorback and Taryn. They were first captured by the Skrulls, but convinced the aliens to send She-Hulk down to the planet. US and the others remained in space with the Skrulls, until She-Hulk was captured and imprisoned, where she met an Ovoid and learned his mind-switching technique. Shulkie tried it and ended up instead swapping physical builds and powers with Weezie. US, Retread, Weezie, and the Skrulls teleported planet side, freed She-Hulk, Taryn, Razorback, the Ovoid, and Rocket Raccoon, and then fled as Vux ("Medusa" D'Bari) set off a petrification effect. The former prisoners explained that the "D'Bari" were actually Xartans (The Carbon Copy Men, from Journey into Mystery#90), posing as D'Bari to hide out from the Skrulls, who wanted to annihilate them for "infringing on their franchise." Make sense? No? Too bad! Go buy and read the issues--boatload of fun! (Sensational She-Hulk#48 - BTS) - Back on Earth, Razorback and Taryn observed a failed attempt by Reed Richards to reverse the body/power swap between the She-Hulk and Weezie. COMMENTS: Created by Al Milgrom, Herb Trimpe, and Steve Ditko. 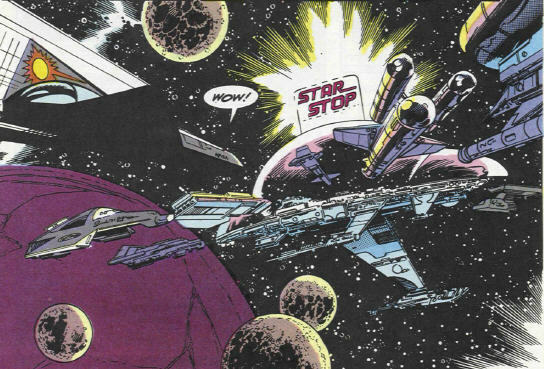 One would ASSume that the Star Stop was rebuilt after the destruction caused by Spragg and the Stone Clones, but this has not been confirmed. 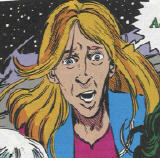 While Razorback has made at least one appearance since Sensational She-Hulk#48, Taryn has not. One can only guess whether they're still together. Interesting minor point - in the image you've put up of the clientele of the Star Stop, easily identifiable is a Venusian Treen (from Dan Dare, a British space hero strip of the 1950's and 60s) drinking a cup of something (probably tea, since he's a British alien), and a Pierson's puppeteer from Larry Niven's Ringworld and Known Space stories (the two heads, bottom left of the picture - that's ONE Puppeteer - Loki. Wide Load Annie's maiden name was revealed in OHotMU A-Z Hardcover#1. Bang Bang! Not to be confused with any other "Short," "Star," or "Stop" places, groups, etc. Also known as "Taryn down the Highway," she was a fellow trucker, and a rival with Mary McGrill for US' affections. She defeated both US and Baron von Blimp in a race for the Chicken Colonel, but lost to US in a rematch. She was framed as Midnight by Mary, and was nearly killed in the process of being subdued, but managed to survive, as well as to help corral the real Midnight. However, despite all of her braggadocio, when the time came to put up or shut up--or to join US in space--Taryn chickened out and stayed on Earth. Feeling regretful, she convinced Razorback to help her find US and the Star Stop, which they did by stealing the Starblazer. 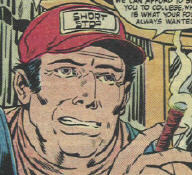 She had chosen Razorback since he was the only superhero who was also a trucker. While the trip was a bust, as US had since gotten married to Mary, she found new romance with Buford/Razorback, and she joined him in his new job as NASA pilot, exploring deep space. Ed Wheelie was a former drag racing champion, before retiring, marrying Wide Load Annie, and opening the Short Stop. He is a skilled mechanic and always a friendly host. When it came time for fighting, though, he always preferred to stay in the backgrounds, and let Wide Load strut her stuff. However, equally as often he served as the voice of reason to her hot-headed nature. He continues his former job at the Star Stop. Taryn picked him up a quarter mile away from the Short Stop after his run-down truck had broken down. He's got a history of trying his hand at just about every career, including being a private investigator, but never found a job that really suited him. That's why he took up driving a truck: He could roam around, looking for something he was good at...and earn a living while looking...besides, it's kinda fun. He rode along with US on a few missions, including the pursuit of the old man who had told them of the Highwayman, and the race against Baron von Blimp. Retread joined the rest of the crew in space and went into hauling space cargo, often riding alongside US in the Star Rig. He and US were overwhelmed by Xemnu the Titan and imprisoned alongside the rest of the crew until Xemnu's defeat. He picked up the transmission from Razorback reporting their capture. He also joined US, She-Hulk, and Weezi in the mission to rescue Buford and Taryn. Anne Getchurgunn took Poppa Wheelie's last name, Wheeler, after getting married. She was a truck driver before getting married, retiring, and opening the Short Stop. Annie's got a fiery temper and likes not too many things better than a good brawl, in which she is always in the center of the action. She tossed Phil LeGreed out of a window when he made threats to foreclose on their mortgage. After that she laid low and hid out with US on a haul until things cooled down. On that mission she secretly raced and beat Iron Mike (King of the Bike), who had been terrorizing a small town. When it was revealed that he had been beaten by a middle-aged woman, his reign of terror was over. She continues his former job at the Star Stop. "US, be sure to eat your green vegetables. Nothing better for a cracked skull than green vegetables." 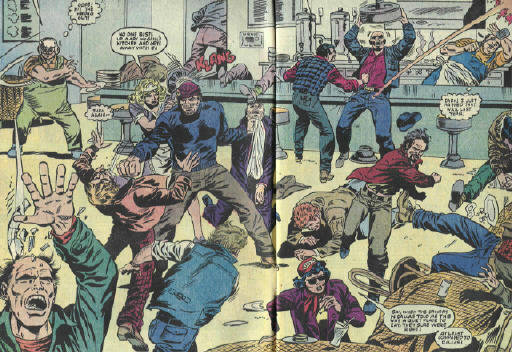 In mid-fight in US One#6, Annie yelled, "Just like Nick Fury says, 'Wahoo!' "
"The looser the waistband, the deeper the quicksand..."